Feit Electric Compact Fluorescent Lamp, BPPL13/41 Designation, 13 W, 120 V, GX23 Base, PL Shape, 800 lumens, 10000 hr Average Life, 4100 K Color Temperature, Cool White Lamp, 6.96 in Length, FCC Compliant, For General Purpose and Task Lighting Saves energy costs by replacing incandescent bulbs with fluorescent. Standardized GU24 socket eliminates pin confusion when replacing lamps or switching to a lamp/ballast with higher or lower lumens. Ballast and lamp are integral, so the overall length is shorter, allowing better fit in some applications. 10,000 average life hours. RoHS Compliant, non-dimmable. Save energy costs by replacing incandescent bulbs with fluorescent equivalents. Electronic ballast; instant on, no flicker. FCC Approved, Energy Star Approved, UL Listed. Save energy costs by replacing incandescent bulbs with fluorescent equivalents. Electronic ballast; instant on, no flicker. FCC Approved, Energy Star Approved, UL Listed. Saves energy costs by replacing incandescent bulbs with fluorescent. Standardized GU24 socket eliminates pin confusion when replacing lamps or switching to a lamp/ballast with higher or lower lumens. Ballast and lamp are integral, so the overall length is shorter, allowing better fit in some applications. 10,000 average life hours. RoHS Compliant, non-dimmable. Save energy costs by replacing incandescent bulbs with fluorescent equivalents. Electronic ballast; instant on, no flicker. FCC Approved, Energy Star Approved, UL Listed. Save energy costs by replacing incandescent bulbs with fluorescent equivalents. Electronic ballast; instant on, no flicker. FCC Approved, Energy Star Approved, UL Listed. 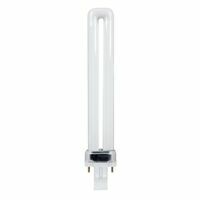 Single compact fluorescent lamp with 2-pin base, ECOLOGIC for use on magnetic ballast. 10,000 average life hours. 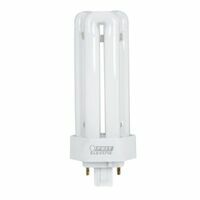 Single compact fluorescent lamp with 2-pin base, ECOLOGIC for use on magnetic ballast. 10,000 average life hours. Saves energy costs by replacing incandescent bulbs with fluorescent. Standardized GU24 socket eliminates pin confusion when replacing lamps or switching to a lamp/ballast with higher or lower lumens. Ballast and lamp are integral, so the overall length is shorter, allowing better fit in some applications. 10,000 average life hours. RoHS Compliant, non-dimmable. Saves energy costs by replacing incandescent bulbs with fluorescent. Standardized GU24 socket eliminates pin confusion when replacing lamps or switching to a lamp/ballast with higher or lower lumens. Ballast and lamp are integral, so the overall length is shorter, allowing better fit in some applications. 10,000 average life hours. RoHS Compliant, non-dimmable. Incandescent equivalent of 125 watt. Simulates full spectrum light and increases the contrast of colors. Used for recessed fixtures and general purpose lighting. 1450 lumens. 5-7/8" length. Saves energy costs by replacing incandescent bulbs with fluorescent equivalents. Use for down lights, wall sconed, exit signs, and task lighting. Ecologic, 10,000 average life hours. 82 CRI (Color Rendering Index). 120 volt, carded. Saves energy costs by replacing incandescent bulbs with fluorescent equivalents. Use for down lights, wall sconed, exit signs, and task lighting. Ecologic, 10,000 average life hours. 82 CRI (Color Rendering Index). 120 volt, carded. 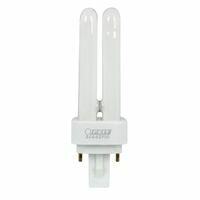 Fits most fluorescent work lights and commercial fixtures. Carded. 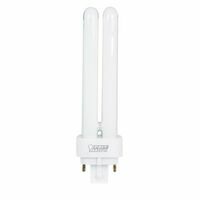 Feit Electric Compact Fluorescent Lamp, BPPLD9 Designation, 9 W, 120 V, G23-2 Base, PL Shape, 525 lumens, 10000 hr Average Life, 2700 K Color Temperature, Soft White Lamp, 4.31 in Length, FCC Compliant, For Recessed Fixtures and Emergency Lights Feit Electric Compact Fluorescent Lamp, BPPLT26E/41 Designation, 26 W, 120 V, GX24Q-3 Base, PL Shape, 1600 lumens, 10000 hr Average Life, 4100 K Color Temperature, Cool White Lamp, FCC Compliant, For Recessed Fixtures and General Purpose Saves energy costs bu replacing incandescent bulbs with fluorescent equivalents. Use for down lights, wall scones, exit signs, and task lighting. Ecologic, 82 CRI bulb, 6.8" overall length.